Click here to download Episode 13 on iTunes. Don't forget to subscribe! In conjunction with WinePHX.com, a newly created wine blog, I continue my series and in episode 13, you hear my interview with the organizers of the very first Gay Wine Weekend, in Sonoma, California. Mark Vogler and Gary Saperstein are the founders of Out in the Vineyard and have put together a line-up of events, special guests and host wineries, that cannot be missed. 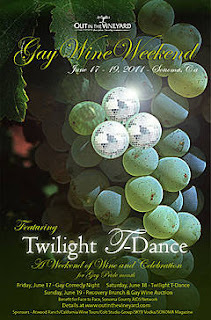 The events continue on Saturday, with the premier event of the weekend - The Twilight T-Dance. A benefit for Face to Face, Sonoma County AIDS Network - this event will feature over a dozen participating wineries, under the stars and Out in the Vineyard at Atwood Ranch.